Dog Boot styles we recommend. Dog shoes, boots and booties are becoming the latest in a long line of popular doggy apparel accessories. When winter temperatures, frozen sidewalks and snowfall are on the way, many pet owners contemplate protecting their canine’s paws with a snug pair of booties – but do dogs really need shoes? The answer is “Yes”! And not just in winter. Dog shoes protect your dog’s paws while hiking and walking on hot asphalt in the summer. Here are a few instances when dog shoes can offer an extra layer of support and safety. During extreme hot or cold temperatures, dog shoes can protect paw pads from frostbite in the winter and burns from hot asphalt in the summer. Dog shoes with traction bottoms can help dogs with mobility problems. No slip shoes can be especially beneficial for senior dogs with arthritis or hip dysplasia when walking on slippery or frozen surfaces. For dogs that enjoy swimming, dog shoes can help to protect paw pads from cuts or scrapes caused by contact with underwater rocks or sharp objects. Reduce risks for accidental scrapes or paw pad tears during short or long hikes with protective dog booties. Dogs who have nerve damage in their legs or backs which cause hind legs to drag can benefit from protective booties. The booties in these cases can prevent scrapes and tears on the tops of the paws if paws drag a bit while the dog is walking. Dog shoes in winter can also provide a layer of comfort when dogs are plowing through snow. In this instance, dog shoes are necessary and they will certainly be appreciated! Winter sled races have long required protective dog shoes. For example, the famous Alaskan 1,000 mile Yukon Quest International Sled Dog Race (often known as the Iditarod) mandates in the Gear and Equipment regulations that each dog must have eight dog shoes allocated (each paw gets a backup). While dog shoes provide protection against frostbite, scrapes and cuts caused by sharp ice during extreme winter sports, they can also protect the paws of our everyday canine friends too. However, it takes a special kind of dog shoe to conform to the movements of a dog’s paw, and some types of shoes can actually limit your dog’s ability to walk or run. Dog shoes to avoid are the types of shoes created to look just like people shoes. These stiff shoes may look adorable on dogs, but dogs cannot walk well in them and may even end up hurting themselves. Instead, look for dog boots made for dog paws. These will look more free form like a sock and less like a structured “shoe”. Make sure they’re a comfortable fit which facilitates the full mobility of the paws – and that the tops of the shoes are secure but not too tight. Here’s a set of dog shoes we recommend. 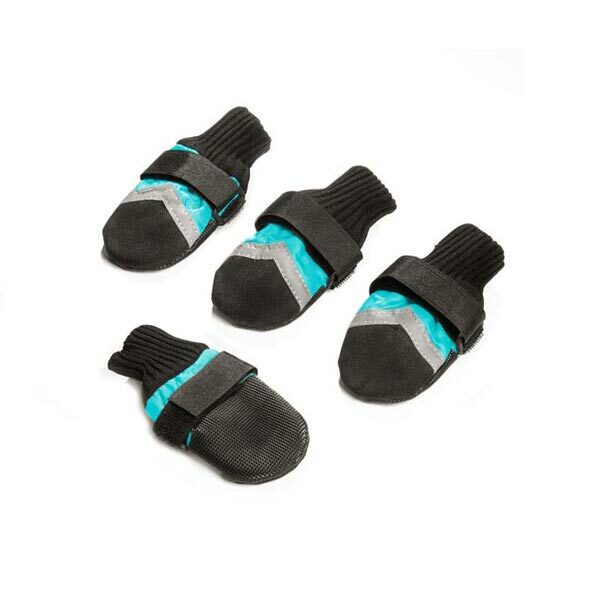 We also recommend The Snuggy Boots Suspender System to keep them on your dog’s feet.